Just as we set aside time to spiritually prepare for Christmas Day, it makes sense to set aside time to prepare for the two most important days of the Christian year. Lent is a time to open the doors of our hearts a little wider and understand our Lord a little deeper, so that when Good Friday and eventually Easter comes, it is not just another day at church but an opportunity to receive the overflowing of graces God has to offer. View this invitation from the Rev. Lee Montgomery, Vicar of St. Jude's to learn more about how you can join members of our congregation to proclaim the Good News of God's love for all people. Working together, we can make Cedar City a better place for everyone. We invite you to join us in our ministries. All are welcome at St. Jude's! We need your help to ensure that our worship space and other church facilities will always be available to community organizations who use our church for meetings, concerts, and events. ​We observe faithful stewardship of God's creation by practicing wise use of natural resources and respect for all God's people. We need your help in practicing the wise and faithful use of God's creation. St. Jude's supports those in need through the Episcopal Relief and Development Fund and "Fifth Sunday" contributions. We need your help with projects that raise money to help victims of poverty and natural disaster. 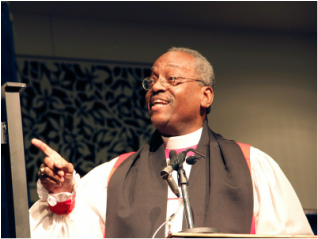 Presiding Bishop Michael Curry recently preached at ta pre-vigil "Reclaiming Jesus" worship service in Washington D.C. “We are not a partisan group, we are not a left-wing group, we are not a right-wing group. We are a Jesus movement!” he proclaimed. St. Jude's hosted the annual Suzuki Strings children's concert recently. Children from across the state participated in this event sponsored by the Cedar City Arts Council. The event helped raise money to support music arts in the Cedar City area.